Our ADHD Story: Stop 'shoulding' on yourself! Then I went on some support groups and asked their opinion. I realized then the pressure that I am putting on myself all the time. I found out I am ‘shoulding’ all over myself! Instead of allowing myself room to decide what is best for me and my family I think about all that I ‘should’ be doing and put all this pressure on myself because then if I do not do it I failed because I am not living up to what I think everyone expects of me. 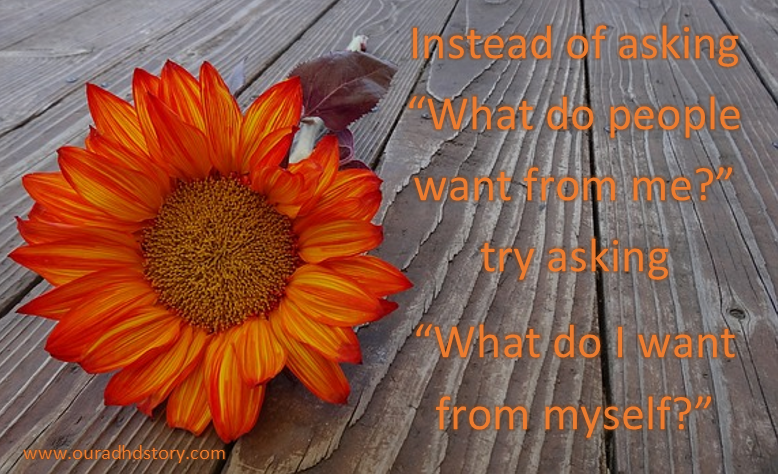 I think it is time for all of us to stop 'shoulding' on ourselves and instead of asking “What do people want from me?” try asking “What do I want from myself? I agree! I do this all the time. Like right now - I'm not feeling well in the least bit, but instead of lying down on the couch, I'm working on my blog instead. I know I'll feel guilty for resting during these hours, but I also know not resting is going to make me feel worse later. I guess you sharing this post was a way of the universe telling me, Go lie down, woman! haha Thanks for sharing with me and my readers! I think we are better off allowing ourselves time to be 'lazy' or 'sick' and not beat ourselves up for it, then the time will be well spent and we will be more energized to get back to work! :) Thank you for sharing!